Browse our collection of pictures from around the campground. Games, Puzzles, coloring and more! 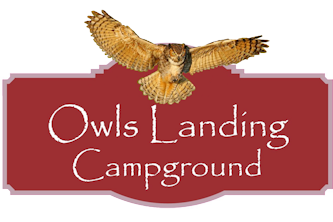 If you would like to book a reservation at Owls Landing Campground, please fill out the SECURE form below. All reservations require a deposit equal to one night's stay. You will receive a responsevia email within 24 hours of submission. Thank You! If you have any other comments, questions or specific site requests please enter them below.Requests for specific sites are not guaranteed, but every effort will be made if you have a favorite location within the campground. Copyright (c) 2011 - 2019 Owls Landing Campground. All rights reserved.